from time to time. Should you object to any term or condition of the TOU, any guidelines, or any subsequent modifications thereto or become dissatisfied with FreePBX.org in any way, your only recourse is to immediately discontinue use of FreePBX.org. Your linking to any other webites is at your own risk and most links will be removed by moderators as to keep all content in FreePBX.org since the linked site may disapear at anytime making the posting useless without the link. Any linking to products that compete with the Core FreePBX eco system products as promoted on FreePBX.org without prior approval will be removed and your account may be suspended. You agree that you must evaluate, and bear all risks associated with, the use of any Content, that you may not rely on said Content, and that under no circumstances will FreePBX.org be liable in any way for any Content or for any loss or damage of any kind incurred as a result of the use of any Content posted, emailed or otherwise made available via the Service. You acknowledge that FreePBX.org does not pre-screen or approve Content, but that FreePBX.org shall have the right (but not the obligation) in its sole discretion to refuse, delete or move any Content that is available via the Service, for violating the letter or spirit of the TOU or for any other reason. 4. THIRD PARTY CONTENT, SITES, AND SERVICES. The FreePBX.org site and Content available through the Service may contain features and functionalities that may link you or provide you with access to third party content which is completely independent of FreePBX.org, including web sites, directories, servers, networks, systems, information and databases, applications, software, programs, products or services, and the Internet as a whole. You agree that FreePBX.org shall not be responsible or liable for any loss or damage of any sort incurred as the result of any such dealings. 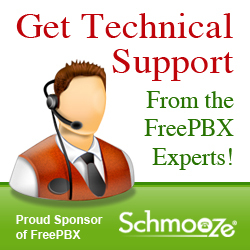 If there is a dispute between participants on this site, or between users and any third party, you understand and agree that FreePBX.org is under no obligation to become involved. In the event that you have a dispute with one or more other users, you hereby release FreePBX.org, its officers, employees, agents and successors in rights from claims, demands and damages (actual and consequential) of every kind or nature, known or unknown, suspected and unsuspected, disclosed and undisclosed, arising out of or in any way related to such disputes and / or our service. If you are a California resident, you waive California Civil Code Section 1542, which says: "A general release does not extend to claims which the creditor does not know or suspect to exist in his favor at the time of executing the release, which, if known by him must have materially affected his settlement with the debtor." Your physical or electronic signature. FreePBX.org will remove the infringing posting(s), subject to the the procedures outlined in the Digital Millenium Copyright Act (DMCA). That constitutes or contains any form of advertising or solicitation if: posted in areas of the FreePBX.org sites which are not designated for such purposes; or emailed to FreePBX.org users who have not indicated in writing that it is ok to contact them about other services, products or commercial interests. That includes links to commercial services or web sites, except as allowed in "services"
That advertises any illegal service or the sale of any items the sale of which is prohibited or restricted by any applicable law, including without limitation items the sale of which is prohibited or regulated by California, Colorado, or Washington law. Use any form of automated device or computer program that enables the submission of postings on FreePBX.org without each posting being manually entered by the author thereof (an "automated posting device"), including without limitation, the use of any such automated posting device to submit postings in bulk, or for automatic submission of postings at regular intervals. Content on behalf of others, except with express permission or license from FreePBX.org. FreePBX.org email addresses or through FreePBX.org computer systems, which is expressly prohibited by these TOU, will use or cause to be used servers located in California. Any unauthorized use of FreePBX.org computer systems is a violation of the TOU and certain federal and state laws, including without limitation the Computer Fraud and Abuse Act (18 U.S.C. § 1030 et seq. ), Section 502 of the California Penal Code and Section 17538.45 of the California Business and Professions Code. Such violations may subject thesender and his or her agents to civil and criminal penalties. Content maintained or transmitted by the Service. You acknowledge that FreePBX.org reserves the right at any time to modify or discontinue the Service (or any part thereof) with or without notice, and that FreePBX.org shall not be liable to you or to any third party for any modification, suspension or discontinuance of the Service. Is provided to general purpose internet search engines and non-commercial public archives that use such tools to gather information for the sole purpose of displaying hyperlinks to the Service, provided they each do so from a stable IP address or range of IP addresses using an easily identifiable agent and comply with our robots.txt file. "General purpose internet search engine" does not include a website or search engine or other service that specializes in classified listings or in any subset of classifieds listings such as jobs, housing, for sale, services, or personals, or which is in the business of providing classified ad listing services. FreePBX.org permits you to display on your website, or create a hyperlink on your website to, individual postings on the Service so long as such use is for noncommercial and/or news reporting purposes only (e.g., for use in personal web blogs or personal online media). If the total number of such postings displayed or linked to on your website exceeds one hundred (100) postings, your use will be presumed to be in violation of the TOU, absent express permission granted by FreePBX.org to do so. You may also create a hyperlink to the home page of FreePBX.org sites so long as the link does not portray FreePBX.org, its employees, or its affiliates in a false, misleading, derogatory, or otherwise offensive matter. FreePBX.org offers various parts of the Service in RSS format so that users can embed individual feeds into a personal website or blog, or view postings through third party software news aggregators. FreePBX.org permits you to display, excerpt from, and link to the RSS feeds on your personal website or personal web blog, provided that. FreePBX.org immediately terminates said permission or license. In order to collect, aggregate, copy, duplicate, display or make derivative use of the the Service or any Content made available via the Service for other purposes (including commercial purposes) not stated herein, you must first obtain a license from FreePBX.org. 13. TERMINATION OF SERVICE You agree that FreePBX.org, in its sole discretion, has the right (but not the obligation) to delete or deactivate your account, block your email or IP address, or otherwise terminate your access to or use of the Service (or any part thereof), immediately and without notice, and remove and discard any Content within the Service, for any reason, including, without limitation, if FreePBX.org believes that you have acted inconsistently with the letter or spirit of the TOU. Further, you agree that FreePBX.org shall not be liable to you or any third-party for any termination of your access to the Service. Further, you agree not to attempt to use the Service after said termination. Sections 2, 4, 6 and 12-18 shall survive termination of the TOU. 14. PROPRIETARY RIGHTS The Service is protected to the maximum extent permitted by copyright laws and international treaties. Content displayed on or through the Service is protected by copyright as a collective work and/or compilation, pursuant to copyrights laws, and international conventions. Any reproduction, modification, creation of derivative works from or redistribution of the site or the collective work, and/or copying or reproducing the sites or any portion thereof to any other server or location for further reproduction or redistribution is prohibited without the express written consent of FreePBX.org. You further agree not to reproduce, duplicate or copy Content from the Service without the express written consent of FreePBX.org, and agree to abide by any and all copyright notices displayed on the Service. You may not decompile or disassemble, reverse engineer or otherwise attempt to discover any source code contained in the Service. Without limiting the foregoing, you agree not to reproduce, duplicate, copy, sell, resell or exploit for any commercial purposes, any aspect of the Service. FreePBX.org is a registered mark in the U.S. Patent and Trademark Office. Although FreePBX.org does not claim ownership of content that its users post, by posting Content to any public area of the Service, you automatically grant, and you represent and warrant that you have the right to grant, to FreePBX.org an irrevocable, perpetual, non-exclusive, fully paid, worldwide license to use, copy, perform, display, and distribute said Content and to prepare derivative works of, or incorporate into other works, said Content, and to grant and authorize sublicenses (through multiple tiers) of the foregoing. Furthermore, by posting Content to any public area of the Service, you automatically grant FreePBX.org all rights necessary to prohibit any subsequent aggregation, display, copying, duplication, reproduction, or exploitation of the Content on the Service by any party for any purpose. 15. DISCLAIMER OF WARRANTIES YOU AGREE THAT USE OF THE FreePBX.org SITE AND THE SERVICE IS ENTIRELY AT YOUR OWN RISK. THE FreePBX.org SITE AND THE SERVICE ARE PROVIDED ON AN "AS IS" OR "AS AVAILABLE" BASIS, WITHOUT ANY WARRANTIES OF ANY KIND. ALL EXPRESS AND IMPLIED WARRANTIES, INCLUDING, WITHOUT LIMITATION, THE WARRANTIES OF MERCHANTABILITY, FITNESS FOR A PARTICULAR PURPOSE, AND NON-INFRINGEMENT OF PROPRIETARY RIGHTS ARE EXPRESSLY DISCLAIMED TO THE FULLEST EXTENT PERMITTED BY LAW. TO THE FULLEST EXTENT PERMITTED BY LAW, FreePBX.org DISCLAIMS ANY WARRANTIES FOR THE SECURITY, RELIABILITY, TIMELINESS, ACCURACY, AND PERFORMANCE OF THE FreePBX.org SITE AND THE SERVICE. TO THE FULLEST EXTENT PERMITTED BY LAW, FreePBX.org DISCLAIMS ANY WARRANTIES FOR OTHER SERVICES OR GOODS RECEIVED THROUGH OR ADVERTISED ON THE FreePBX.org SITE OR THE SITES OR SERVICE, OR ACCESSED THROUGH ANY LINKS ON THE FreePBX.org SITE. TO THE FULLEST EXTENT PERMITTED BY LAW, FreePBX.org DISCLAIMS ANY WARRANTIES FOR VIRUSES OR OTHER HARMFUL COMPONENTS IN CONNECTION WITH THE FreePBX.org SITE OR THE SERVICE. Some jurisdictions do not allow the disclaimer of implied warranties. In such jurisdictions, some of the foregoing disclaimers may not apply to you insofar as they relate to implied warranties. 16. LIMITATIONS OF LIABILITY UNDER NO CIRCUMSTANCES SHALL FreePBX.org BE LIABLE FOR DIRECT, INDIRECT, INCIDENTAL, SPECIAL, CONSEQUENTIAL OR EXEMPLARY DAMAGES (EVEN IF FreePBX.org HAS BEEN ADVISED OF THE POSSIBILITY OF SUCH DAMAGES), RESULTING FROM ANY ASPECT OF YOUR USE OF THE FreePBX.org SITE OR THE SERVICE, WHETHER THE DAMAGES ARISE FROM USE OR MISUSE OF THE FreePBX.org SITE OR THE SERVICE, FROM INABILITY TO USE THE FreePBX.org SITE OR THE SERVICE, OR THE INTERRUPTION, SUSPENSION, MODIFICATION, ALTERATION, OR TERMINATION OF THE FreePBX.org SITE OR THE SERVICE. SUCH LIMITATION SHALL ALSO APPLY WITH RESPECT TO DAMAGES INCURRED BY REASON OF OTHER SERVICES OR PRODUCTS RECEIVED THROUGH OR ADVERTISED IN CONNECTION WITH THE FreePBX.org SITE OR THE SERVICE OR ANY LINKS ON THE FreePBX.org SITE, AS WELL AS BY REASON OF ANY INFORMATION OR ADVICE RECEIVED THROUGH OR ADVERTISED IN CONNECTION WITH THE FreePBX.org SITE OR THE SERVICE OR ANY LINKS ON THE FreePBX.org SITE. THESE LIMITATIONS SHALL APPLY TO THE FULLEST EXTENT PERMITTED BY LAW. In some jurisdictions, limitations of liability are not permitted. In such jurisdictions, some of the foregoing limitation may not apply to you. 18. GENERAL INFORMATION The TOU constitute the entire agreement between you and FreePBX.org and govern your use of the Service, superseding any prior agreements between you and FreePBX.org. The TOU and the relationship between you and FreePBX.org shall be governed by the laws of the State of California without regard to its conflict of law provisions. You and FreePBX.org agree to submit to the personal and exclusive jurisdiction of the courts located within the county of San Francisco, California. The failure of FreePBX.org to exercise or enforce any right or provision of the TOU shall not constitute a waiver of such right or provision. If any provision of the TOU is found by a court of competent jurisdiction to be invalid, the parties nevertheless agree that the court should endeavor to give effect to the parties' intentions as reflected in the provision, and the other provisions of the TOU remain in full force and effect. You agree that regardless of any statute or law to the contrary, any claim or cause of action arising out of or related to use of the Service or the TOU must be filed within one (1) year after such claim or cause of action arose or be forever barred. That includes personal or identifying information aboutanother person without that person's explicit consent, you agree to pay FreePBX.org one thousand dollars ($1,000) for each such message. This provision does not apply to messages that are lawful non-deceptive parodies of public figures. If FreePBX.org establishes limits on the frequency with which you may access the Service, or terminates your access to or use of the Service, you agree to pay FreePBX.org one hundred dollars ($100) for each message posted in excess of such limits or for each day on which you access FreePBX.org in excess of such limits, whichever is higher. If you send unsolicited email advertisements to FreePBX.org email addresses or through FreePBX.org computer systems, you agree to pay FreePBX.org twenty five dollars ($25) for each such email. If you post Content in violation of the TOU, other than as described above, you agree to pay FreePBX.org one hundred dollars ($100) for each Item of Content posted. In its sole discretion, FreePBX.org may elect to issue a warning before assessing damages. "Principal"), and the Principal (by engaging the Posting Agent in violation of the TOU) agrees to pay FreePBX.org an additional one hundred dollars ($100) for each Item of Conent posted by the Posting Agent on behalf of the principal in violation of the TOU. If you aggregate, display, copy, duplicate, reproduce, or otherwise exploit for any purpose any Content (except for your own Content) in violation of the TOU without FreePBX.org's express written permission, you agree to pay FreePBX.org three thousand dollars ($3,000) for each day on which you engage in such conduct. Otherwise, you agree to pay FreePBX.org's actual damages, to the extent such actual damages can be reasonably calculated. Notwithstanding any other provision of the TOU, FreePBX.org retains the right to seek the remedy of specific performance of any term contained in the TOU, or a preliminary or permanent injunction against the breach of any such term or in aid of the exercise of any power granted in the TOU, or any combination thereof. 20. FEEDBACK We welcome your questions and comments on this document by email.